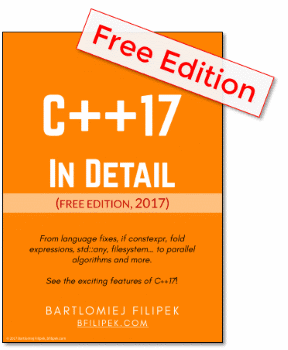 Some time ago I wrote about micro benchmarking libraries for C++ - here’s the link. I’ve described three libraries: Nonius, Hayai, Celero. But actually, I wanted to cover fourth one. Google Benchmark library was at that time not available for my Windows environment, so I couldn’t test it. Fortunately, under the original post I got a comment saying that the library is now ready for Visual Studio! Let’s see how can we use it. Thanks to KindDragon commit: Support MSVC on appveyor we can now build the library under Visual Studio. Without any problems I was able to download the latest repo, use CMake to generate solution files, then build a proper version. To use it with your project, all you have to do is to link to the library itself and include one header file. IntToStringConversionTest(count) - converts numbers 0…count-1 into a string and return vector of it. DoubleToStringConversionTest(count) - converts numbers 0.12345… count-1+0.12345 into a string and then return vector of those strings. Nice and simple! BENCHMARK macro is used to define a benchmark, then you can add invocation params. In the example above I’ve used Arg method. The parameter inside that method will be passed into the state object that is available to the benchmark function. In our example we can fetch the value as state.range_x(). This value is then translated into the size of the numbers vector. Inside the benchmark function there is a while loop where the main code is executed. The library will automatically set the number of iterations. We get a really simple output: benchmark name, time in nanoseconds (can be changed through Unit() method), CPU time, iterations invoked. What are the nice features of the library? Easy passing of custom values: Arg, ArgPair, Range, RangePair, Apply. So you can create one or two dimensional problem space benchmarks. Manual timing: useful when you execute code on GPU or other devices where standard CPU timing is not relevant. Another output: with bytes processed, items processed, custom label and changed time units. 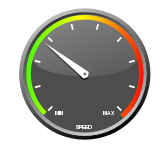 In the another post about micro benchmarking libraries I’ve used a bit more advanced example to test benchmark libraries. It’s my standard benchmark - vector of pointers vs vector of objects. Let’s see how can we implement that experiment with Google Benchmark. Particle class: holds 18 floats: 4 for pos, 4 for vel, 4 for acceleration, 4 for color, one for time, one for rotation. Plus there is a float buffer - we can change number of elements in that buffer. 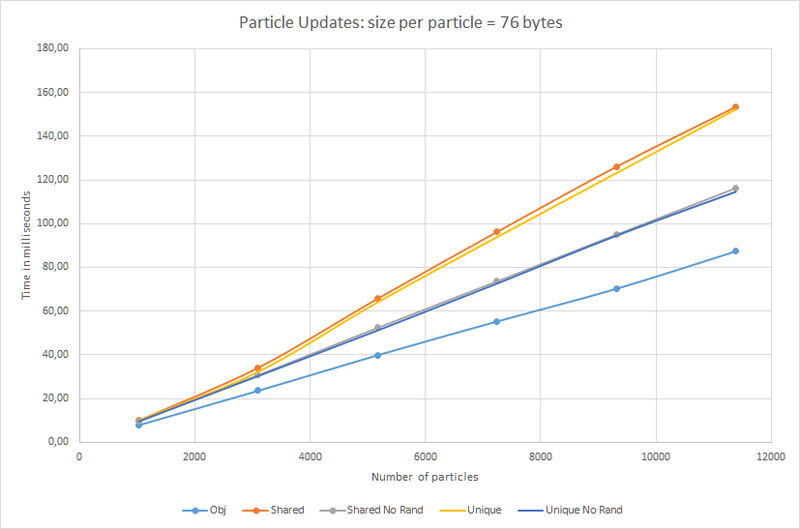 Larger particle is defined for 160 bytes. We want to measure Update method on a vector of particles. 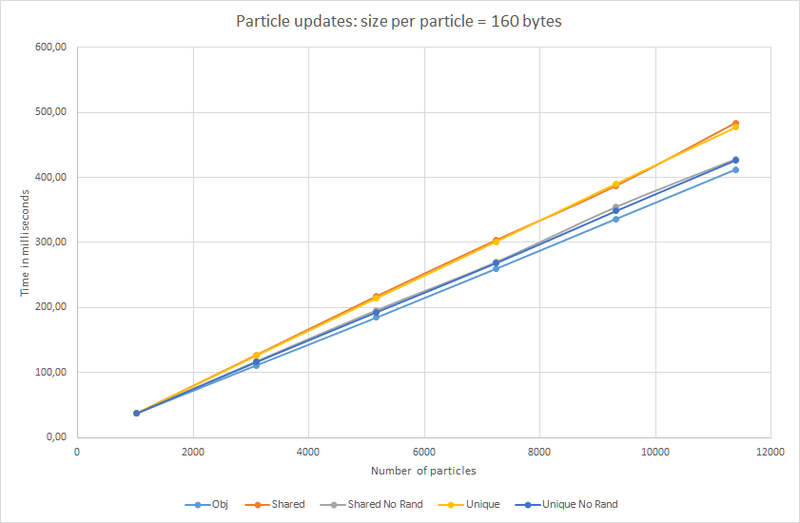 With the above code we test for two kinds of particles: smaller - 76 bytes abd larger - 160 bytes. CustomArguments method generate number of particles in each benchmark invocation: 1k, 3k, 5k, 7k, 9k, 11k. In this blog post we focus on the library itself, but I wanted to cover one thing that was asked in the past: different size of a particle. I used only two kinds for now: 76 bytes and 160 bytes. Randomized pointers are almost 76% slower than vector of objects. Additionally, unique_ptr is also tested. And, as you can see, in terms of updates (access to the data) the speed is almost the same as for shared_ptr. The indirection is the problem and not the overhead of the smart pointer. I had no problems with using Google Benchmark library. In several minutes you can grasp style of building benchmarks. Multithreaded benchmarks, fixtures, automatic iteration estimation, CSV, or Json output formats, those are all solid features. I especially liked flexibility of passing parameters to the benchmark code. Other libraries that I’ve tested had some problems with passing a ‘problem space’ values into benchmark code. Celero was the easiest on in that area. What’s missing for me is the lack of advanced results. The library provides only a mean time of the iterations. Still, in most cases that’s good enough. In terms of the experiment: I got interesting results when measuring different size per particle. It’s a good base for the final future test. I’ll try to recreate my examples again with more diversity of object size. I expect to see a huge difference when the object is small, and small difference when the object is large.